The UK has - at points in our history - been proud to welcome refugees. The present day is, unfortunately, not one of those periods as we are unequivocally conforming to the global trend of attempting to control and repel migrants through increasingly draconian measures, such as detention. The UK now wins the less illustrious prize for detaining the highest number of asylum seekers, aside from Australia. The government’s determination to look tough on immigration is sullying the UK’s human rights record. 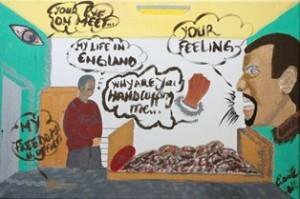 For people who have experienced detention first hand our proud history means little. The present and the future of Britain’s immigration policy weigh heavily on their shoulders, with the threat of being re-detained experienced as a daily burden. The devastating speed of the process of dehumanisation from person to ID number to government statistic is fresh in their minds. The contrasting glacial pace of change is infuriating, frustrating, frightening. On 10 December, UN Human Rights Day, a parliamentary meeting brought together MPs, NGOs, concerned individuals and people who have been detained. Each speaker outlined the violations of human rights that detaining people brings about. Roland Schilling, from UNHCR, the UN Refugee Agency, discussed the cornerstones of human rights and how detention flies in the face of these principles: the prohibition against torture and inhumane treatment, the right not to be arbitrarily detained or imprisoned and the right to liberty. Over the last year, the High Court has four times found that the detention of vulnerable individuals amounted to cruel and degrading treatment that breached their human rights under Article 3 of the European Convention on Human Rights. In one case, Hamish Arnott from Bhatt Murphy solicitors explained that the High Court described the UK Border Agency (UKBA) as having shown ‘callous indifference’ towards a man whose mental illness had led him to stop eating. According to the centre’s Healthcare Manager, he could die imminently and was unfit for detention. UKBA were busy preparing a press release in case he died, but failing to recognise the nature and extent of his illness. Given the high threshold that exists for the Court to rule that Article 3 has been violated, these cases may seem shocking, but it comes as no surprise to anyone who works with people who have been detained. Hamid, who was in detention for over three years, attended the parliamentary meeting. He said that when he was first detained he was surprised at the level of self harm, the visible progression of mental decline of those incarcerated alongside him. Suicide attempts, hunger striking, people crying in corridors and endless doses of anti-depressants became part of a normal day for Hamid. Immigration detention centres are prisons, with barbed wire and people locked in cells every day. The prison regime includes being held in a small cell for 23 hours a day when you first arrive in detention. Hamid remembers sleeping with his head next to the toilet. In the one hour you are allowed outside, he explains that all you can see around you is concrete, then barbed wire in a small court yard. It’s like walking into an ash tray, he recalls, with so many anxious smokers huddled together in the confined space. Rights to liberty and security of person and freedom of movement are expressed in all major international and regional human rights conventions. According to UNHCR, the presumption of liberty should be the default position. But in practice, it is the presumption of detention that is practiced within UKBA. This is a practice that sees thousands of asylum seekers and migrants’ rights flouted every day. Theresa May is currently attempting to force judges to ignore the right to family life in deportation cases. In case that doesn’t work, cuts to legal aid will mean that it will no longer be available. Put simply, people will not be able to afford to fight for their right to see their children. So the future looks particularly bleak for people who find themselves in Jay’s position. At the parliamentary meeting it was clear that everyone in the room was impatient for change. It is easy to become disappointed or disillusioned with the lack of progress. But last month, we saw unusually powerful criticism of long term detention from HM Inspectorate of Prisons in a report on Lincoln prison, where they found a Somali man who had been detained for nine years after the end of his prison sentence. The following day saw a joint report from the Inspectors of Prisons and of Borders and Immigration which criticised the UKBA for routinely detaining people coming to the end of their prison sentences, rather than maintaining the presumption of liberty enshrined in human rights norms. The Inspectors found that up to 38% of people who had been held for 6 months in detention had not applied for bail to be released and a quarter had no legal representative. There is no automatic system for independent review of detention for months which turn into years. The Inspectorates propose an interesting solution: an independent panel to review all cases of long-term detention to consider whether “exceptional and clearly evidenced circumstances” apply that can justify continued incarceration. Could such a panel bring the expertise and evidence-based analysis that the UKBA so clearly lacks? Could it circumvent the politicisation that has infected the decision-making of an agency under constant and fierce pressure from Ministers and the tabloids? Rigorous reviews by a genuinely independent panel could potentially be a significant step away from routine long-term detention. But ultimately only a time limit provides a sure safeguard against indefinite detention. In France, the limit on detention is 45 days. In Malta, there is a policy of automatic detention but a time limit of 18 months. In fact, the UK is one of only three countries in Europe that refuses to ratify the European legislation which imposes a time limit of 18 months on detention. The pace of change may be glacial but there is growing momentum for change which is giving rise to optimism that our future treatment of asylum seekers and migrants can restore our pride.